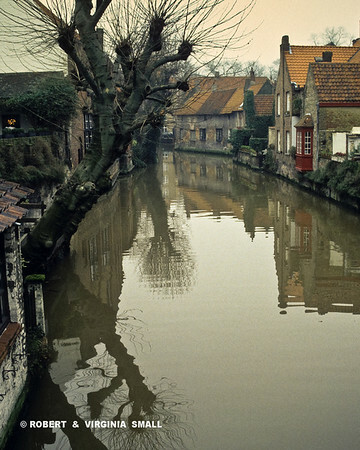 December 30, 1999 Tomorrow is New Year's Eve and the beginning of the New Millennium and we plan to move to Brugge, Belgium, and spend the holiday there, a place we have enjoyed several times in the past. Well, if the world is going to come to an end, we say, it’s a good place to be! But first, we have to wait for the other three boxes of slides to come in. They are quite late, delayed in all the rain they say, but by 2 pm we’re off down the autostrasse. Perfect navigation and dumb luck (Hey, if you’re good, you’re good!) puts us directly in front of the Hotel Ibis and we checked in for three nights and dashed out to re-acquaint ourselves with one of our favorite places to be. The early evening is a bit chilly with mist hanging overhead, which just adds to the atmosphere. The square is crammed with happy folks all bundled up and wandering amid the holiday decorations. We thought briefly about repeating Robert’s past year’s record of TWO full lobster dinners (he ordered and ate both of them, which nonplussed the waitress!) but decide to wait and feast tomorrow on New Year's Eve.